Most diffusers seem to perform the same function. It works by transforming water containing you choice of oil into cool mist in order to create a pleasant smell, and likewise allow the oil’s healing qualities to be diffused into the air. If you are considering to get one for your home, office, or spa, then you are free to choose whichever you like. However, among the myriad of sizes, shapes, designs, and different features, it can be overwhelming to find exactly what you are looking for. Truth is, they are not made equal, and the ultrasonic type is regarded as the best diffuser for essential oils. One of which is the URPOWER Aromatherapy Diffuser which is today’s bestseller for many good reasons. It will give what you both need and want from its appearance to all its remarkable qualities, which you will discover in this detailed review we have outlined for you. The lovely colors of the soft lighting create a soothing effect and encourages a better mood as it changes from one shade to the next, beautifully fading away to reveal another lovely color. The 7 LED lights include the colors red, pink, yellow, green, dark and light blue, and white. It is adjustable between bright and dim modes and can be left steady on if you prefer. This serves as a great night light for kids who are scared of the dark, which would make bedtime fun, comforting, and put them to a much-needed good sleep. 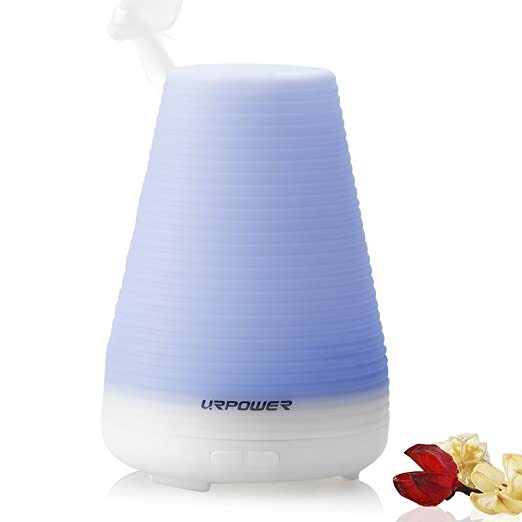 A highly effective and the best diffuser for essential oils, this ultrasonic URPOWER diffuser promotes relaxing aromatherapy and unleashes its optimal benefits. It utilizes high frequencies to separate essential oils to be dispensed as micro-fine mist throughout the room atmosphere. This action works to purify your environment, improve health, It requires less oil and does not use any kind of heat that can have a detrimental effect on the oil’s prowess. Just 2-3 drops into the large 100 ml water capacity will revitalize your spirit for up to 3 hours! Red – the unit will auto shut off once the water runs out. Green – the unit turns of automatically after 3 hours. There’ll be no fuss whatsoever from operation to maintenance. It makes life easier by simply plugging in the power cable to both unit and outlet, putting water and adding a few drops of oil, pressing the mist button to enjoy aromatherapy, and pressing light for a dab of color! Cleaning up requires only a small amount of water, a small cleaning brush, and a soft cloth to wipe clean the exquisite textured exterior. Break-free from stress and the fast-paced modern lifestyle as you unwind in your very own cozy space, or simply by entering a room and breathing in the essential-oil infused air. It deodorizes the air too as it eliminates pet odors and those sourced from smoking and replenishes it with aromatic fragrance that’s pleasing to the senses. It does not produce any noise and works quietly in the backdrop that you wouldn’t even hear it turn off. This delivers a peaceful, calm and comfortable room that greatly contributes to your wellness. You can finally get that rest and sleep you deserve in the environment that suits you best. As a humidifier, it is best used for air-conditioned rooms or during dry seasons like winter. It will effectively produce moisture in the air that prevents cracked skin and will keep it from drying out. The humid air comforts your sinus and helps prevent congestion, colds and flu as well. The compact design makes it very portable. Ordinary tap water will do which you can quickly find almost anywhere. You can use it with or without essential oils for aromatherapy. This makes it the handy companion wherever you go, and enjoy your favorite scent while achieving the perfect ambiance wherever you wish. What makes it a top choice by many consumers? All the aforementioned features make it quite obvious how the URPOWER Aromatherapy Essential Oil Diffuser has gained popularity. It never fails to provide a satisfying, high-quality durable product and give delightful results to customers. Out of the majority of people who bought and gave it a thumbs up, if not two, some were dissatisfied but for reasons that may be addressed. It was deemed too small, but there are larger diffusers offered by the same brand as well, while some found it a bit of a challenge to pry open. It’s advisable to ensure there’s no water inside before you try to to prevent any mess. Some just didn’t like the design but then again, you have the freedom to choose your own style when it comes to diffusers. Your purchase comes with the diffuser itself, the charger, measuring cup and user manual that presents ease of use. People love how it fits their busy lifestyle while it gives them security of a safe accessory at home. The unit itself serves as an attractive home accent that can dramatically change the ambiance in any room. Moreover, it instantly bestows a splash of wonderful colors in any room which makes it even more lovely! Is this the right diffuser for me? The URPOWER Essential Oil Diffuser is ideal for small to medium sized areas like the bedroom, bathroom, living, dining, and baby room. It’s perfect for the home, beauty salon, spa, yoga, office, hotel, hospital, reception area, conference room, and any other space that must deliver the best quality of air to people inside it. The unit can be used solely for the light itself, with the mist, as a diffuser or humidifier, and placed in any room. You get great value for your money and benefit from this amazing feature-packed, best diffuser for essential oils that has a number of purposes. It’s a wise investment not only in a good product, but for your home, business, and most importantly, your health and wellness.